Things are improving around here at May Dreams Gardens. The heat has moved out and we had some rain this afternoon and earlier this evening. So far, one quarter of an inch of rain here, which I'll take, and as an added bonus, there is a japanese beetle trapped in the rain gauge. That's one less beetle eating on my flowers! If the weather clears up enough, and it probably will, I may be able to go out and do some light deadheading before dark. And what will I use? Something sharp, no doubt. So, today, I present some tools that are sharp as Gardening Tool Week continues! This first sharp tool is a set of garden shears made by Burgon & Ball, a rather well known English company that makes all kinds of garden and sheep shears. The reason I got these is because at one time White Flower Farm decided to publish a magazine called "The Gardener", and if you subscribed for a year for about $25, they would give you a $100 gift certificate for anything in their catalogs. I mulled this over because I thought there was a catch, then went for it. Sure enough, I got the gift certificate and 10 issues of the magazine before they stopped publishing it. But I digress. Anyway, I pondered for a long time how to use my $100 gift certificate, and finally decided one of the items I would get was these garden shears. They came in a very nice box, and were held together with that little metal sleeve that's still on them. I carefully removed that sleeve and was impressed how sharp the blades were. I also realized right away that these shears were too big for my hands, and thus awkward for me to use. So, I carefully closed them up, put the little metal sleeve back on to keep them closed, and hung them way up high where I would not be tempted to get them down and try them out. I'm guessing I've saved myself from some awful injury! This is a grafting knife. It's used to make a nice, straight, quick cut on the end of a scion, which is the branch that will be grafted onto the root stock. I got my first grafting knife when I was at Purdue and took a class in plant propagation, where we learned how to cut the scion at just the right angle. 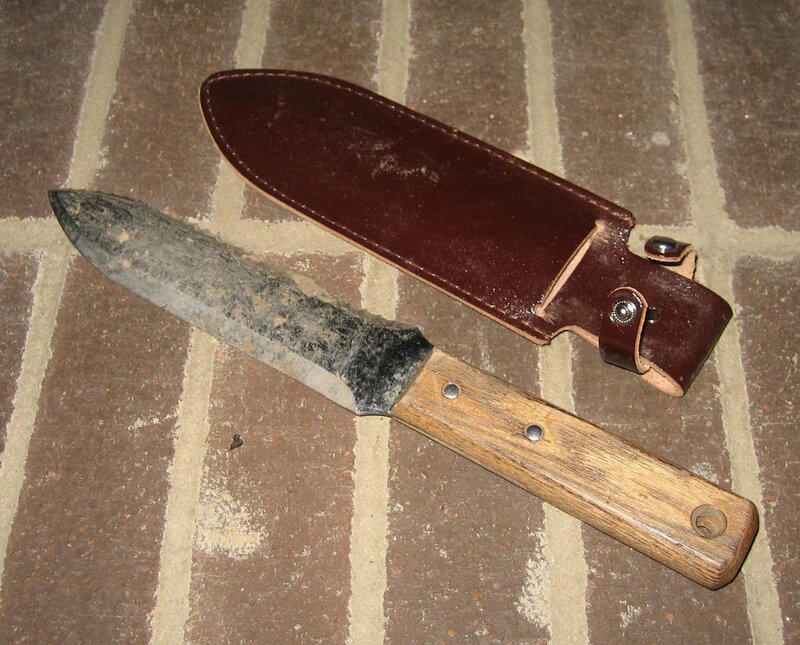 That first knife then became the knife I carried around to cut open bags of mulch and top soil but it was inadvertently left outside and got a little rusty. I found a replacement in a seed catalog. I'm not in the habit of going around grafting plants, but it does make for a dandy knife to use for other things around the garden (like cutting open bags). And here is another tool from Lee Valley. This is a Japanese digging knife. It's great for digging out things that otherwise just don't want to come out of the ground. Tough weeds? Easily dug out with this sharp knife! Good sized rocks? I don't think you can break this blade! Please don't tell my mom I have all these sharp tools. I promise I am careful with them. This little gem of a knife is a perennial knife also from Lee Valley. The curved blade and serrated edge make it perfect for dividing up all kinds of perennials. This is a keeper and a tool that makes what can sometimes be a daunting task, dividing up a plant, much easier. I divide plants with great confidence armed with this knife. And the sharpest sharp tool in the garden shed... my Felco pruners. Their website proudly proclaims "Felco pruners will change your life" and I think it's true. You will never miss a cut with a good pair of Felco's. Mine are model no. 8. I also bought the holster to clip on to my pants. I never step out into the garden without my Felco pruners at my side. Anyone who has Felco pruners will agree with me and the website. These pruners will change your life. If you can only save up for one good tool, save up for Felco's! Enough said. 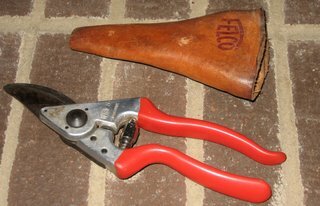 So, I'm off to the garden to see what I can prune with my Felco's. Tomorrow, we'll wrap up gardening tool week. After all, the weather is improving, so the plants are ready to return as the real stars of the garden. Felcos #8 here, too. I remember seeing those shears in the WWF catalog - wasn't there some hype about hearing them 'sing' as you worked? I love my pruners, but my favorite digging/weeding tool is the Cape Cod weeder with the L-shaped beveled blade. You can reach into the bed and can control it well - it's like having one very strong, very large, sharp metal fingernail. Isn't it funny how personal people can get about their weapons of choice, garden-wise? I am a huge fan of Felco #8 though I will say it is best to try them all out before you pick your number. I am also a gigantic fan of the Hori-Hori (that Japanese digging tool you mentioned). When I go to the garden, I put the pruners and the knife and a flat-bladed fork into the pockets of my work pants. No way I can lose things if I continue to put them back in the pants pockets! Your tool collection is fantastic! You inspired me to check out my own Felco's. I posted a pic at my blog.